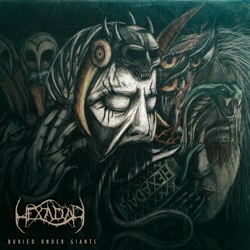 German pagan black death metallers Hexadar released their new album “Buried Under Giants” on the 5th of September 2014. It’s the second full-length album of the band after 2011′s debut full-length “Hexadar” and 2010′s EP “Frühe Gezeiten“. The new album contains 12 tracks, of accordion extreme metal, as the band labels its music. This time pagan metal influences are reduced and many death metal elements are added to the mix. “Buried Under Giants” was self-produced and was released independently in a limited to 500 copies digipak edition CD. On this album there are also two guest vocalists, Jakob Prohn of Trashwave on “Howling” and Stormmson of Rabenwolf on “Endstufe Stillstand“. You can get a first taste of their unusual music watching the official lyrics video for the song “Howling“.